The information located under Admin Settings will determine the basic appearance and functionality of the software. Each section contains information for initial account setup (Account, Front Page Message, Payment Provider, Email Templates, Categories, User Groups, etc). Enter basic business information here. The Account/Site name is displayed on the login page and at the top of the software. The abbreviated version shows in cases where the full version does not fit on the screen. As a security feature to keep unwanted users from accessing your software, new users signing up from the login page will be required to enter a Registration Code. The general registration code for account registration is set here. Organizations can also be created with unique registration codes to automatically register and track each organization’s users. In the theme section, select theaccent colors and images used to brand your account. To add a color, type in the six digit hex code for the color or click on the color square and use the easy color picker. Add images in this section to brand the account with logos and watermark backgrounds. 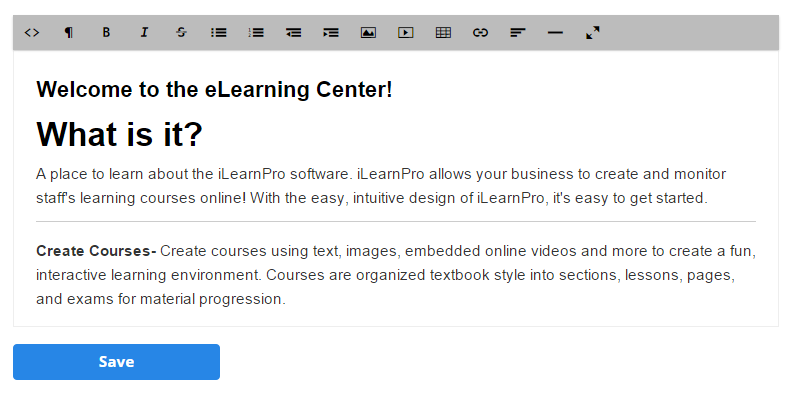 For further assistance with branding using theme settings, visit our article A Closer Look at Branding in iLearnPro. Under configuration, the option of using Organizations can be turned on and off. Organizations are used to divide students into groups with one or more appointed managers to track their progress. When turned off, all users will be managed by Account Administrators. If turned on, the Organization Manager role is activated. Organization Managers can access organizational level information and assign unique registration codes to allow new members to create accounts that are automatically assigned to the organization. Insert a greeting message to display on the home page when users login! Customize the greeting with text formatting, pictures, embedded videos, and more! This is also a great place to provide initial instructions, announcements and updates for users to see the next time they log in to the system. HINT: The Heading 1 line style will automatically use the highlight color chosen in your settings. To bill for course registration online, a gateway account must be integrated with iLearnPro to securely process payment information. In this tab, add your gateway information to form a secure integration with your processor. NOTE: Using test mode will submit test transactions to the gateway to ensure the account is communicating properly before going live with registration. To begin charging customers, the “Use Test Mode” box must be unchecked. These templates are plain text emails that are sent out automatically when a user completes an order through the shopping cart or completes a course. Customize the message and include Tokens (variables) to fill in user specific information within the email content. Available tokens are listed at the top of each template. The categories listed here are used to organize the courses within your account. User groups are created and applied to both users and courses to restrict the courses that can be viewed from the course catalog. Users and courses can be attached to multiple user groups. Click on Add User Group. Enter a Title for the user group.